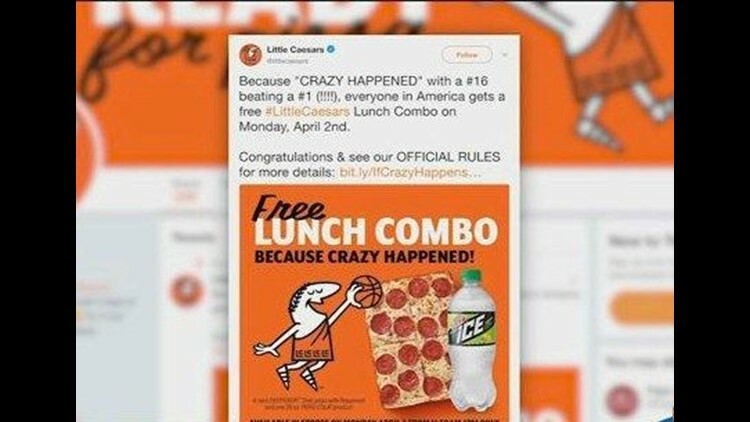 SAN DIEGO - Dozens of Little Caesars pizza restaurants around San Diego County will give away free lunches Monday as part of a national promotion thanks to a little-known college basketball team from the other side of the country. Patrons can pick up a free 4-slice deep dish pepperoni pizza and a 20 ounce Pepsi product between 11:30 a.m. and 1 p.m. Monday at Little Caesars restaurants when they mention the promotion, which is all thanks to one of the biggest upsets in college basketball history. Before the NCAA Tournament began last month, the pizza chain promised the free lunch combo "if crazy happens." The crazy in that equation was something that had never been done before in more than 130 tries: A No. 16 seed beating a No. 1 seed in the March Madness tournament. But what seemed like a safe bet for the pizza chain was upended when the 16th seeded Retrievers from the University of Maryland beat the University of Virginia Cavaliers 74-54, on March 16. "You're welcome, America," tweeted UMBC's athletic department on Monday with a link to the free pizza offer. The free lunch combo offer comes on the day that Michigan will play Villanova to decide the men's basketball national championship. Tip-off for the game in San Antonio, Texas, is set for 6:20 p.m. here in San Diego. Note: To qualify, you must place your order no later than 1:00 p.m. (local time). If you place your order afterwards, even if you were in line at 1:00 p.m. (local time), the offer will have expired and will not be fulfilled.